See, my friend Kaylei from Attack Initiative challenged me to actually take an objective look at Portal, meaning I can’t just say “LA LA LA AWESOMENESS LA LA CAKE LA LA LA” and run away. No, I’m actually going to have to go in depth as to /why/ I feel so strongly about Portal and its sequel. Hell, I’m going to actually have to find a /flaw/ somewhere in there and expose it for the entire world to see! It’s true that I’ve been putting this off for a week or so, partially due to the holidays and partially out of my own reluctance and partial inability to actually find that flaw. And, as I start this writing, I still don’t really have a plan firmly in mind for what I’m going to say, other than to just talk about this series and what I think it’s done for the medium as a whole. Portal came onto the stage not with any sort of major promotion, but seemingly as an afterthought. It was a part of Valve’s “Orange Box” Half-Life 2 bundle which also included HL2, its sequel episodes, and Team Fortress 2, the Valve-developed sequel to a popular fan-made mod for the original Half-Life. It simply appeared to be a mod or a proof of concept, slipped in under the radar to see how it did. The reality of it is something far more awesome. The original concept behind Portal was a game called Narbacular Drop, developed as a project by a group of students from DigiPen. The concept caught the attention of one of Valve’s developers, who brought the team in for a pitch. The result? The entire team was hired to work on the game that would be Portal. Of course, this story is a fairly well-known one now, one of the great legends of the gaming industry, but it has only become so because the game itself was of such high quality. When the game first hit the shelves, nobody really knew any of that. I certainly didn’t. In fact, I didn’t really know what to expect, other than that I’d heard that Portal was good. Very good. /Astonishingly/ good. So I fired it up and was greeted to.. a clear glass room that was obviously some sort of living quarters with some muzak playing in a loop in the background. I was then greeted to some of the most brilliant introduction to game mechanics ever. Nobody ever tells you about the portals. You are shown, and then expected to figure out what to do from there. This begins a trend that defines the way you move through a game. You are shown things, and are expected to have the mental resources to figure out what to do with those things. The game doesn’t talk down to you, but at the same time it doesn’t go out of its way to spell things out to you in words. Sometimes it’s obvious what to do, and sometimes it isn’t. The important part is that your eyes don’t lie to you. Which is a good thing, because very early on you realize that the disembodied voice that can be at first mistaken for an automated recording /is/ lying to you. That voice belongs to GLaDOS, one of the only characters in the game with a speaking part. I won’t spoil any of her brilliantly written and voiced lines, I will just say that she is quite possibly one of, if not the, most well-written characters in anything, ever. Not just because she is both crazy and polite, and it takes talent to be able to pull that off well, but because she accomplishes all of this while conversing with a /silent protagonist/. I am absolutely in awe of how one can turn ‘talking to a silent person’ into ‘dialogue’. Of course, the real brilliance is that you are told very early on exactly what the plot twist is, and it is still surprising the first time. The other real brilliance is that the game will make you care for an inanimate object more than you care about most real people, and if this is not the case for you then you have no soul. What I’m saying is that it’s a quality plot. But how does the gameplay measure up? Well, also brilliantly, since it’s built on the same engine as Half-Life 2,which, if you’ll recall, did some really awesome things with a gravity gun. I mean, really, I don’t have any complaints about the gameplay because, with very few exceptions, it doesn’t rely on reflexes and coordination as it relies on you, the player, being able to determine /what/ to do in a situation. It’s definitely a thinking person’s game, and it’s why I think it’s such a great educational tool. It teaches spatial recognition and reasoning skills, two things which I think are otherwise fairly lacking. The one complaint I would normally have about the game isn’t really a complaint at all: it is a very short game. I went through it in six hours the first time, and two hours each subsequent time. It really is a bite-sized chunk of a game, an appetizer, if you will, carefully designed to give you just enough and leave you wanting more at the end. However, even given its short length, it is so very worth whatever money one originally paid for it. Even if I didn’t like Half-Life 2 or Team Fortress 2, I still would have bought the Orange Box solely for Portal. Someone else said this about it: “In a world where there are $60 games I wouldn’t pay $20 for, Portal is a $20 game that I would gladly pay $60 for.” And I agree with this wholeheartedly. With the resounding success of Portal and with it having been carefully designed as a teaser, naturally the gaming public clamored for more Portal. And naturally, Valve, being Valve, took their sweet time. I mean that with all respect, because Valve puts out some quality games and they do it by not releasing something until they’re happy with it, and by not announcing something until they’ve gotten it mostly done. Right from the start, though, things would be different going into Portal 2. The primary reason for this is simple: expectation. People went into Portal having absolutely no expectations of it, and were overwhelmingly pleasantly surprised. This time around was quite the opposite: people had overwhelming expectations for this game, and so the responsibility would then fall upon the game to live up to those expectations. 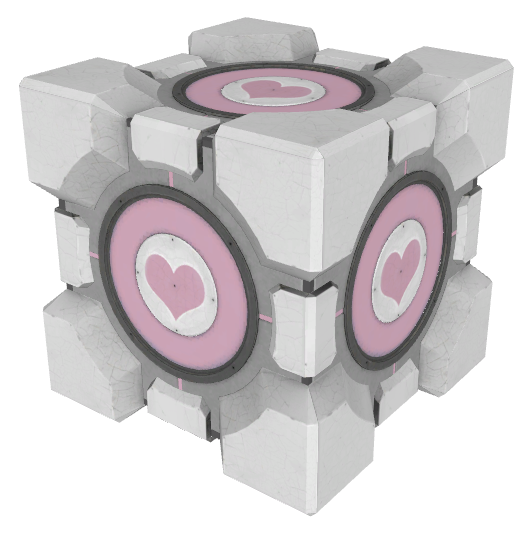 Of course, for a game with the word ‘portal’ in the title, there is really one thing that it absolutely has to have. Sure, Valve could have done something else, had some other primary mechanic, and called the game something different, but then it wouldn’t be ‘Portal 2’, and therefore the disappointment would be there from the beginning. In fact, Valve considered doing just that, but then changed their minds after that little detail leaked to the public. So, without a significant change in gameplay mechanics, what else is there to do to liven things up, to make the sequel feel as if it is worthy of existing? Well, meaningful additions to the setting and series lore. The first game was very,very ambiguous in its setting. It was nominally set in the Half-Life universe, but gave absolutely no location or timeframe information. Portal 2 doesn’t give you anything in those regards either, but what it does do is expand on the history of Apeture Science.It also includes more characters with speaking parts. Sort of. Those speaking parts are just as brilliantly done as the singular performance of GLaDOS in the first game, and the fact that there is actual interaction between speaking characters this time around really adds to the experience. At the same time, though, it really makes your silent protagonist feel out-of-place, even though they specifically call her out this time as being an actual mute. Even returning character GLaDOS (sorry, spoilers) brings something new to the table as she comes out as less confident and far more petty than she was in the first game. However, the show-stealer this time around is Cave Johnson, the charismatic former CEO of Aperture Science, who is present in quite a few of the promotional materials for the game, as well as the game itself (in a capacity that I will not spoil for you, either). Just a heads up, we’re gonna have a super conductor turned up full blast and pointed at you for the duration of this next test. I’ll be honest, we’re throwing science at the walls here to see what sticks. No idea what it’ll do. So what else does it bring to the table? Length. The game is about three times as long as the first Portal, which is expected, as this time around Valve opted to make the game a stand-alone product. Rightly so, as Portal definitely deserved that sort of treatment. It also brings a multiplayer mode. Now, I know what you’re thinking: ‘Multiplayer? In MY Portal? ?” Well, it is actually executed fairly well. Each player is given one portal gun, and the puzzles are carefully designed to not be solvable alone (well, mostly. I know if I looked around the internet, I could find videos of people who have done it). It also provided cross-platform play between PC and Playstation 3. More on that later. With all these additions, surely that means that Portal 2 was pretty amazing, right? Well, yes, but it was also…… just more of the same. That isn’t to say that that’s a bad thing. What we all wanted was more Portal, and what we got was more Portal. It was funny, it was sad, it was more than a little disturbing, and that’s exactly what everyone wanted. However, where the first game did not overstay its welcome, this one just barely was on the verge of it. This might be because I played through it so quickly. A better thing may have been to spread the experience out and savored it; however, when I get it into my head to marathon something, that’s what I do. The other issue I had wasn’t even the fault of the game itself, it was the fault of the internet community at large. The Steam PS3/PC crossplay was supposed to be something pretty great, and it is. It was supposed to be a launching point for Steam integration on consoles, and…..it fell flat. Coincidentally, the very week that Portal 2 was releasing, the Playstation Network was hacked and went down for a month, thus stifling Steam’s entry into console functionality. As of the time of this writing, almost two years later, Portal 2 is still the only game that has PS3/PC Steam crossplay. It’s sad that something that had potential got more or less ruined by idiots, but what can you do. So, that’s what I think. Portal is just as amazing as everyone says it is, and so is Portal 2, though slightly less so due to what I consider a couple of missed opportunities. I think that even as amazing as both Portal games are, the series does not need to be revisited anymore with its current mechanics; Portal 2 said everything that needed to be said about it, really. If anything, the series should connect with a future entry into Half-Life (….whenever that happens, am I right? ), or be revisited with a different primary mechanic, as Valve had considered doing with Portal 2 to begin with. So really, what I am going to end with is, see, Kaylei, I did it, Portal is both objectively /and/ subjectively awesome, and everyone should play it.